I was only thinking about Hanne, even though she was sitting in the same room as I was. Or was it thinking? . . . it was more as if I were full to the brim with emotions which did not leave any space for thought. And so it remained for the whole of the winter and spring. […] Every morning I awoke and looked forward to going to school, where she would be. If she wasn’t there, if she was ill or out of town, all meaning immediately drained out of everything, the rest of the day was just a question of endurance. For what? What was I waiting for while I was waiting? Knausgaard’s last question here perfectly captures the appeal of My Struggle, a book that ultimately seems to be about nothing more, or less, than “waiting.” There is a creative writing maxim that instructs the writer to take his time getting to the climax of a scene and then, once that climax has been reached, to get out. Knausgaard does this one better by getting out before he has even gotten in. The young Karl Ove sits in his classroom thinking about Hanne a few desks away . . . and then suddenly two whole seasons have passed, and he is in love. The climax of the story—the one that I had been growing more and more anxious for as Karl Ove’s glances grew more desperate—is omitted, meaning that, on a narrative level at least, it is not important, or at least no more important than anything else. Performed only occasionally, such antidramatics would feel accidental, but Knausgaard’s persistence raises them to the level of method, creating a world in which to see is to write, and to write requires a constant combination of order and chaos. “For several years I had tried to write about my father,” the narrator says at one point. “But had gotten nowhere, probably because the subject was too close to my life, and thus not so easy to force into another form, which of course is a prerequisite for literature.” A few sentences later he adds, “Writing is more about destroying than creating.” Form and destruction: the two words run like rails through My Struggle, creating an energy that we see not only in the writing itself, but in the book’s central relationship between the jittery, unformed narrator and his rule-obsessed father. A powerful, but deeply frustrated patriarch, the older Knausgaard haunts his son’s life both before and after his death. His alcoholic dissolution ends (for himself at least) in the inevitable tragedy, but for his sons, the suffering continues into an agonizing but also occasionally cathartic aftermath. Karl Ove and his brother are informed of their father’s passing and then immediately called in to clean it up, which they do one room at a time, scrubbing and dumping and generally just reasserting some small order in the midst of what appears to be catastrophe. They succeed, in the same way that Knausgaard has: by paying attention to the individual details of their world with such tenacity that eventually those details detach themselves from the surrounding chaos and become bricks in something new. What is that something? 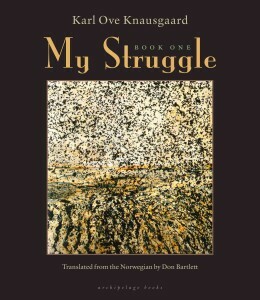 My Struggle is the first of six books in a cycle that Knausgaard has written (translated into English by Don Bartlett), a fact that would seem to urge caution on the reader overeager to trace its themes. But as Knausgaard himself reminds us continually, all readings (and writings) leave something out. The mysterious truth of this is easy to forget in a world where every new story burns to leapfrog its peers into the unquestionable realm of myth; but it’s true nonetheless, in a way that anyone who’s ever written a line, or a recipe, or told a joke can attest. Describe a death meticulously, down to the last shudder, and it will still not be death: it will be dead. Leave the right things out, on the other hand, and you might find yourself creating something even more startling: a book so shot through with emptiness and death that it leaves its readers feeling full and alive. A deeply morbid book, My Struggle is nonetheless as full of life as a boat is of wind or a house is of light. Josh Billings originally reviewed Book One of My Struggle for TLR’s Late Fall 2012 issue, Loss Control.